When Dean and I left the (relative) cool of Adelaide to make our way north, we had no idea doing so would take us out of the frying pan and into the fire. Our plan was to ‘duck up to Uluru’ before it got too hot, but Mother Nature had other ideas and sent a heat wave in our direction. After leaving Annie’s Lane and the Clare Valley behind, the drive north was rather scenic, past grain fields, vineyards, and lush country. We parked near a crop of wheat to enjoy lunch and I marvelled at the baby Weet-bix (ha ha). From Port Augusta we drove to Coober Pedy, the Opal Capital of the World, and a world unto itself. We stayed two nights to have a full day to be tourists. We had to visit Crocodile Harry’s Underground Nest, this home featured in the underground scenes of “Mad Max – Beyond Thunderdome”. We also visited underground museums and displays and giant buckets (rebuilt after the original was destroyed by a cyclone of all things). We went noodling for opals, but sadly came up empty. From any angle, The Breakaways are amazing. The colour of the sandstone is incredible. Mad Max – Beyond Thunderdome was one of many movies filmed here. Priscilla Queen of the Desert was another. The Castle or Papa (Two Dogs), locally called Salt and Pepper. Looking back at the first lookout. The Dingo Fence, the longest fence in the world and built to keep dingos out of the southern (fertile) areas of south eastern Australia. The Moon Plain – Looks just like photos taken from Mars. Where is the Mars Rover anyway? Life underground, where it is a constant, cool, comfortable temperature regardless of how hot or cold it is outside. The exterior of Crocodile Harry’s Underground Nest. Coober Pedy. Can you see the home built into the side of the hill? As easy as the driving was to reach Coober Pedy, our next day was quite epic. We were still 750 kilometres (466.5 miles) from Uluru and decided we would cover as much of this as possible, as long as the going was easy, and it was. Many times we felt we were the only ones on the road, just two lost souls wandering through the centre of Australia, and more than once we drove for 30 minutes or more before seeing another vehicle. As quiet as it can be, you still have to share the road. In the Australian Outback we expect to see kangaroos, endless horizons and lots and lots of red dust. But we should also expect to see Road Trains and lots of them. 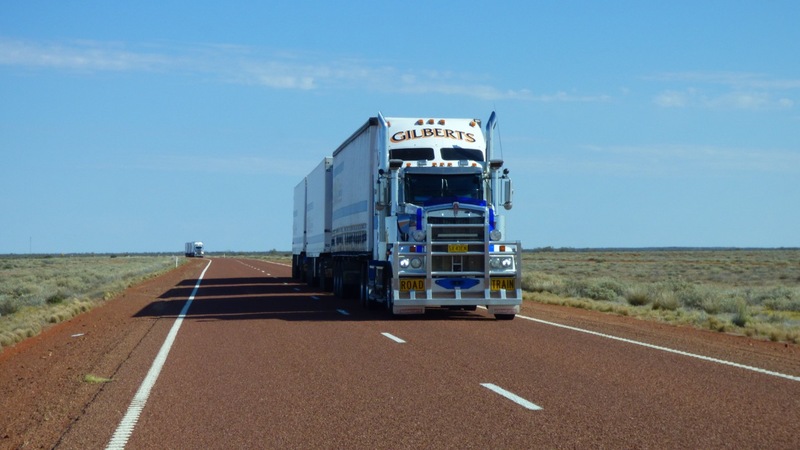 These long haul vehicles are an integral part of the Australian Outback, delivering necessary goods and supplies to remote communities. Here is the complete featured image above of the B-Triple (and his travelling partner) approaching us. Two approaching Road Trains on the Stuart Highway – B-Triples were the largest we saw but these were still over 50 metres in length (164 feet). In my opinion, the drivers of these Road Trains are heroes who deserve our respect. I must confess, my heart rate increased considerable when I was driving, but I did all the right things – I moved over to ensure they had enough room to pass and focused on travelling forward in a straight line. Thankfully, the road was wide enough when I was driving and Dean was driving when the road was narrow. We crossed the South Australia – Northern Territory border around 2:30 pm and soon after, turned off the Stuart Highway onto the Lasseter Highway, with only another 246 kilometres (152 miles) to reach our destination, but as the day grew old, we chose to spend the night in a free camping area at Curtain Springs Cattle Station. Driving at night is not a good idea in this part of the country, so as it gets dark it becomes necessary to ‘pull over’. We were only 140 kilometres from Uluru (86 miles), but safety must always take priority. 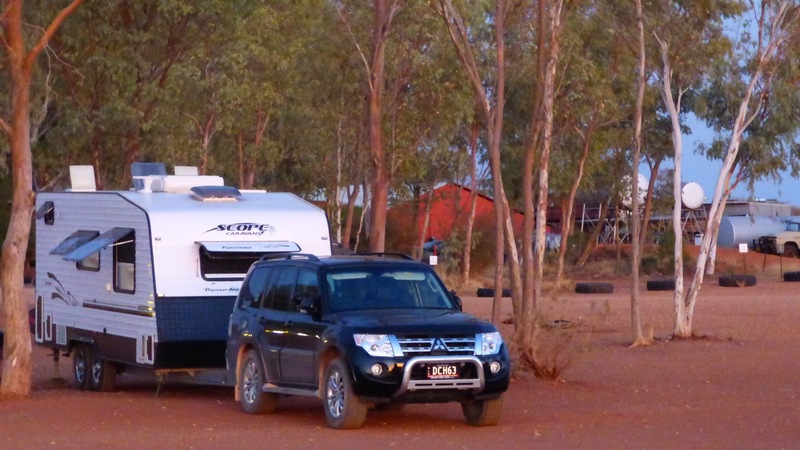 We stayed at the Port Augusta Big4 Holiday Park on the north side of town, and with the Bathurst 1000 on Sunday, we settled in for a couple of nights so Dean could watch the big race. Missing the NRL Grand Final was hard enough, missing Bathurst would have been a little too much for him to bear. The park was clean and tidy, and although on the highway, we found it to be rather quiet. We stayed at the Stuart Range Outback Resort, a Big4 Holiday Park and, given where we were, the park itself is well thought out. Water is available from a ‘dispenser’ upon entry as taps are not available on the sites, but the quantity dispensed is very generous for the cost involved. You have to remember, in an arid environment, water is a very precious commodity, and even 20 cents for two minutes in the shower isn’t too much to ask. Here we are amid the red dirt. The camping area at the Curtain Springs Cattle Station was merely somewhere to park while we slept, with the added bonus of amenities (including showers). But the heat was something else. At 6 pm it was still 38°C (100.4°F) and after driving all day, we were both surprised that the water in our tanks was heated, substantially so, and it was overnight before it cooled down. Dean and I arrived at Yulara yesterday morning with 1,607 kilometres (998.9 miles) behind us after leaving Adelaide on Saturday morning. Not a huge distance when taking into consideration the size of our country, but the most we’ve travelled so far in such a short space of time. I lost count of the number of times the landscape changed over those five days. We were amazed to be 30 minutes from Yulara when we caught our first glimpse of Uluru. Our intention is to stay here at least four days, then we’ll see what happens after that. Stay tuned for lots of stunning photos with sunrises, sunsets, base walks, Kata Tjuta, Kings Canyon and countless other places and activities to be involved in and with. Geez. Quite the desert. Looks like Utah, Arizona, and New Mexico! Of the three states we probably have the mildest climate. But even here it can get up to 103 degrees in August. How hot does it get there? Arizona and New Mexico, OH! and Nevada average in the 106 range in the deep summer. Not that I’m trying to brag or anything, but where we are now, in Australia’s (red) centre, it can get up to 48/118.4. There are no words to describe that sort of heat and, although it is unseasonably hot at the moment, we are only experiencing 40/104 at the hottest time of the day – usually around 3 pm. Dad and I are having a lovely time and I’ve so many more photos, I’ll just have to pick the best.